Physics problems with pseudo force with solutions- so you well understand that these problems are going to related with non inertial frame of reference.Let’s solve these interesting numericals. Here the block is placed on the inclined plane. So the inclined plane will act as the frame of refernce for any motion of the block on it. 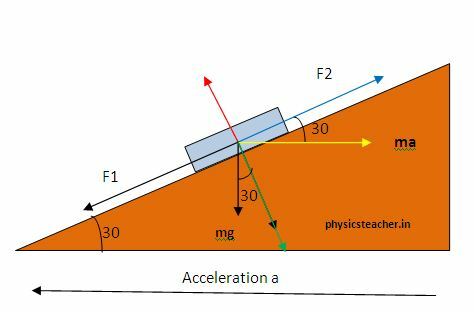 As the inclined plane is in constant acceleration, so we can say that the block is resting on a non-inertial frame of reference.To solve this kind of numeric problem, we take help of a concept known as pseudo force. We will use it to solve the problem here. where m is the mass of the block resting on the wedge. F1 is the resolved component of weight mg and F1 tends to drag the block downwards. As the wedge is at acceleration, it’s to be taken as a non-inertial frame of reference. To solve this kind of problem, concept of pseudo force helps a lot. 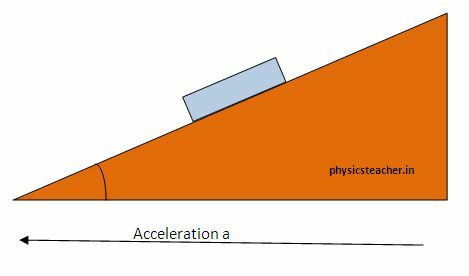 As the wedge moves with a constant acceleration a (from right to left direction as per the diagram), the block on it will appear to have a pseudo force towards right (when observed by an observer resting on the accelerating wedge itself). Now resolved component of this pseudo force along the wedge’s inclined surface =F2. Now, it’s evident that if F1= F2 then the block won’t slide down or up.